I'm all for adding extra storage to your bathroom, we've featured tubs with built in shelving before (here's one of them), but never in a square bathtub like this one. The colour combo of this bathroom is a nice change. 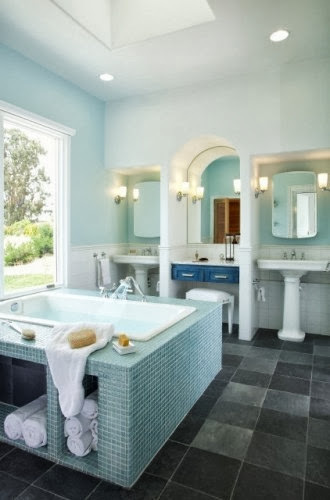 The little aqua blue tiles go great with the grey slate floor. And I like the pop of brighter blue on the makeup station vanity. But back to the tub base design, do you like how they used the grey slate tiles inside the shelving or would you have tiled the whole thing in the small mosaic tiles instead? I love all about this theme. Blue is my favourite. Blue's my favorite colour too. Thanks for stopping by!